Recent misadventures by a high-profile Toronto columnist have pointed out to the weakness of our pressured and relentless journalistic culture. Margaret Wente of the Toronto Globe and Mail was revealed to be a plagiarist by a very relentless blogger, Carol Wainio, a professor at the University of Ottawa, through her website Media Culpa. Wainio has had Wente in her cross-hairs for a number of years. The tendency by many (but not all) in the Toronto media was to ignore the accusations of serial plagiarism as just the obsessions of a serial pest. took the Globe and Wente to task. They agreed that Wainio has shown that Wente had an undeniable history of plagiarism. They also went after the mainstream media in general for its timidity in dealing with this story because it appeared to involve a colleague. 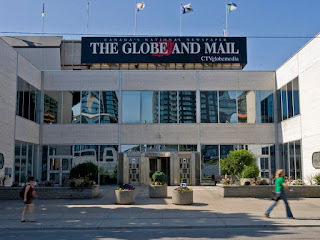 The Globe's public editor Sylvia Stead (full disclosure - Ms. Stead is a member of the Organization of News Ombudsmen - ONO - where I am the executive director) seemed to compound the defensiveness and squeamishness of the mainstream media when she admitted that her initial response to the allegations of plagiarism appeared to be less than forthright. In the few days before the story broke open in the US and British press, the Canadian media was still hesitating. A few scribes felt conflicted. "How can I interview her?" said one well regarded journalist. "I've had drinks with her." Eventually, the mainstream Toronto media were forced by social media and by the more aggressive Brits and Yanks to deal with the story. They did so, more in sorrow for a fallen comrade than with any overwhelming sense of needing to take corrective measures. While Wente was evidently wrong and finally wrote about in a somewhat contrite column, I also feel a sense of compassion for her. Not for what she did. But for the relentless pressure that she and many high-profile journalists have come to accept as normal. Wente was writing three columns a week. After producing at that rate, and doing so for years, I'm not surprised that she may have grabbed other writers' phrases and ideas. Her reputation depended on those columns as did the reputation of the Globe. And in this media market, the pressure to perform and to produce can be relentless. Jonah Lehrer at the New Yorker and Fareed Zakariah at CNN and Newsweek also seemed to fall victim to that kind of pressure. It has as much to do with keeping up appearances and maintaining an "acceptable" level of celebrity as it does in churning out the content day in and day out. Journalistic celebrity can be a great temptation. And also a curse. In my career, I've never hit those heights, but I have felt it slightly, when strangers tell me what a swell job I'm doing and what an interesting life I must be having. It's heady stuff, but ultimately, deforming of what is really important about journalism. Good media management is what is needed to keep journalists grounded yet still motivated. Sometimes, given the egos involved, it's difficult and occasionally, quite impossible. But essential. Also helpful would be a work schedule that is less destructive so as to allow for more thoughtful, creative journalism able to resist the temptation of plagiarism. Wente and Stead are now on leave from the Globe and expected back "in a few weeks."